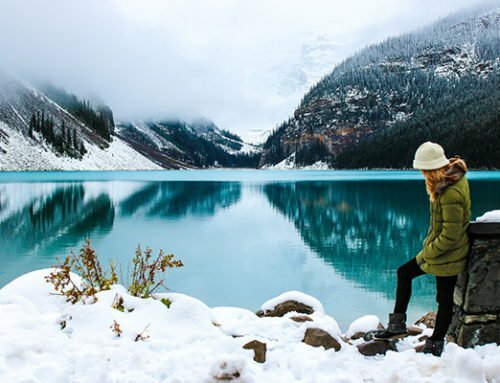 Christmas is around the corner, and buying presents for someone can sometimes be difficult. In this blog, we will be showing you 5 of our products that are great mega posters, and a great gift this Christmas. 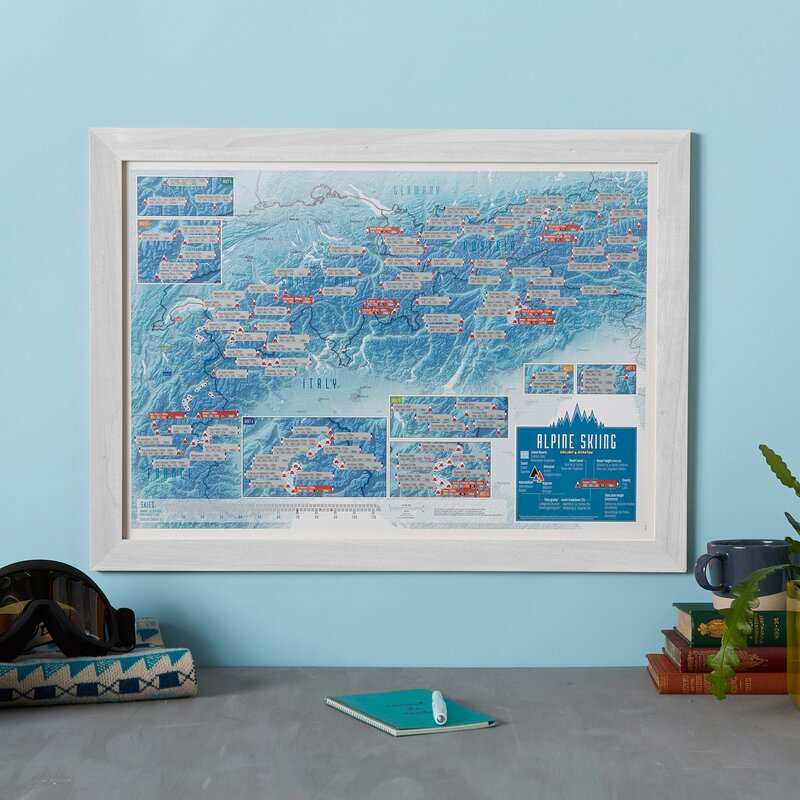 These maps could be given as a special gift to someone or even a treat to yourself after all the hard work you’ve done buying presents for your loved ones. This politically coloured wall map features every country as a different colour. 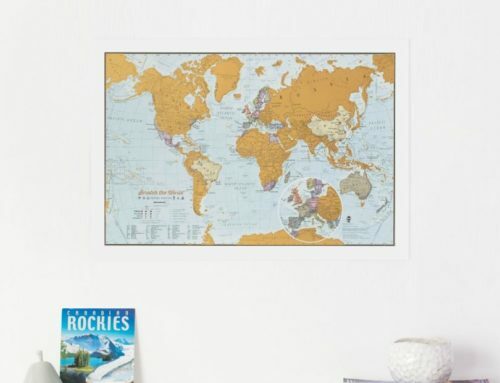 All major towns and cities are featured on this huge map and capital cities are clearly marked. 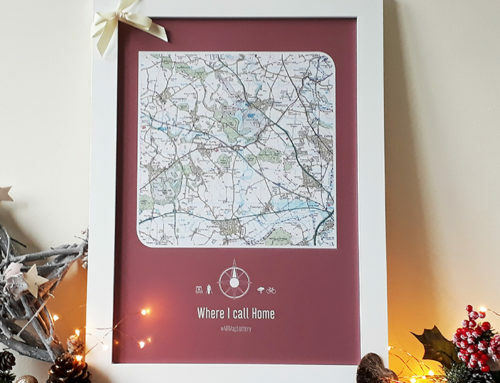 The map also features hill and sea shading for an overall vibrant effect, and would be perfect for the home, office or even given as a gift because of the variety of finishes we offer. 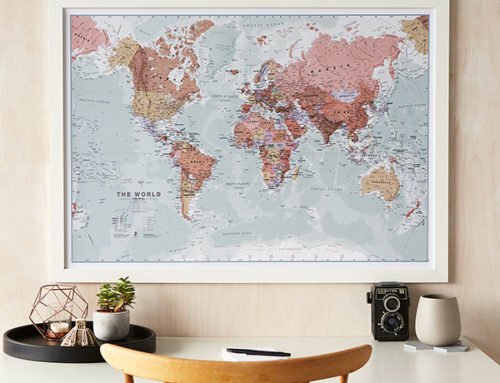 This map is a stunning and stylish Antique map that is an elegant wall piece and would look great in your home or office as the focal point of your room. 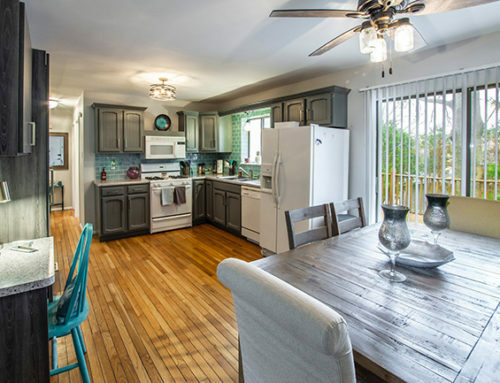 This map is extremely popular due to its muted tones. It comes with political detail, meaning the countries are shaded in different tones as well as country boundaries and cities are shown. 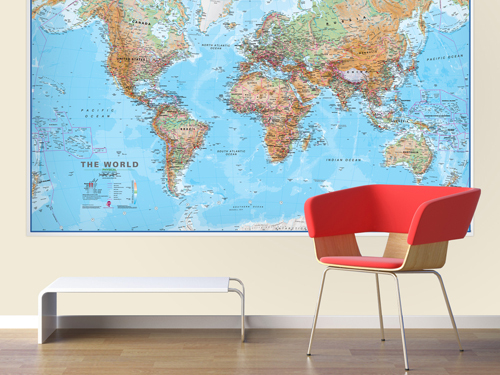 Our huge classic world map would be a great centrepiece in any home or office. This is due to its great detail as well as being stylish but still a very practical wall piece. 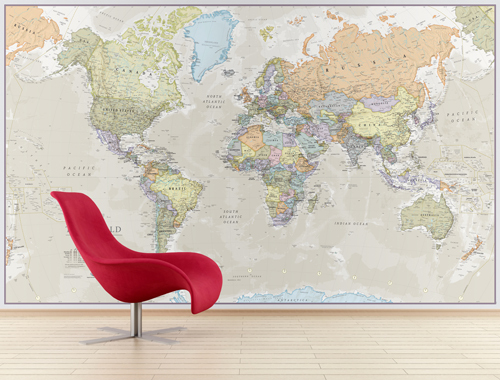 Countries are shaded in different colours to give it political detail, boundaries and cities are clearly shown so you can make the most out of this stunning wall piece. 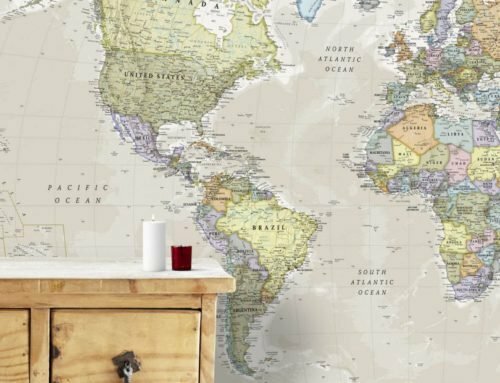 This Giant World Map Mural is supplied on strips of wallpaper to make it easy for you to fit it in any room in your house or office. This map is politically coloured, and features all major towns and cities. Vibrant effects are added with hill and sea shading. 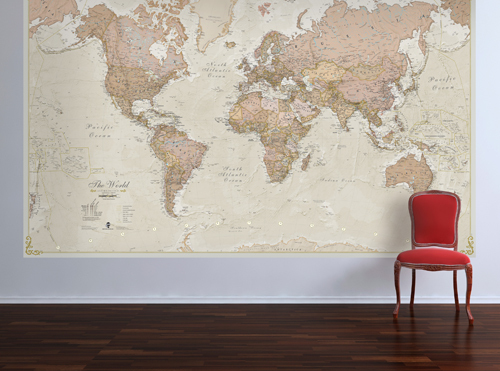 The final map is the classic version of our murals. 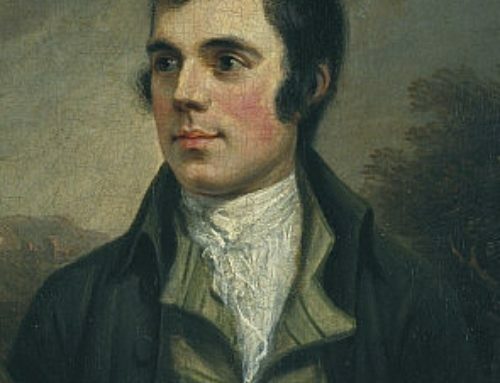 This piece is contemporary and is also supplied on strips of wallpaper. 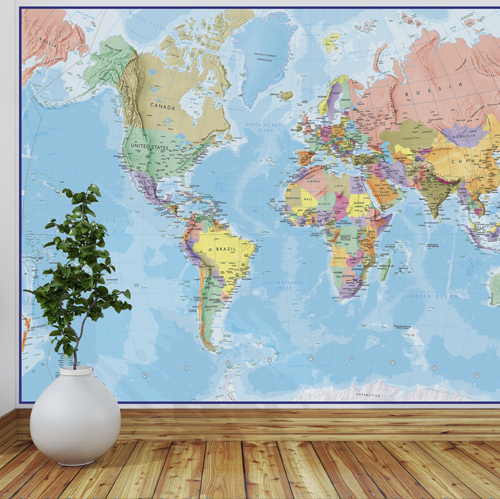 This is one of Maps International’s best selling world maps, and is the finest map you’ll find! This map is also politically coloured, and features all major towns and cities. Vibrant effects are added with hill and sea shading.